If you wanted to change the product edition (Advanced / Enterprise / Platinum) of a Citrix XenApp (4, 5 of 6.0) server this was done per server. How you can change the product edition is explained in this article on Citrix Blogs. In Citrix XenApp 6.0 this was done either via the console of via a PowerShell cmdlet called Set-XAServerEdition. Since the product edition in XenApp 6.5 is no longer set per server (but via a Policy) this cmdlet is removed. 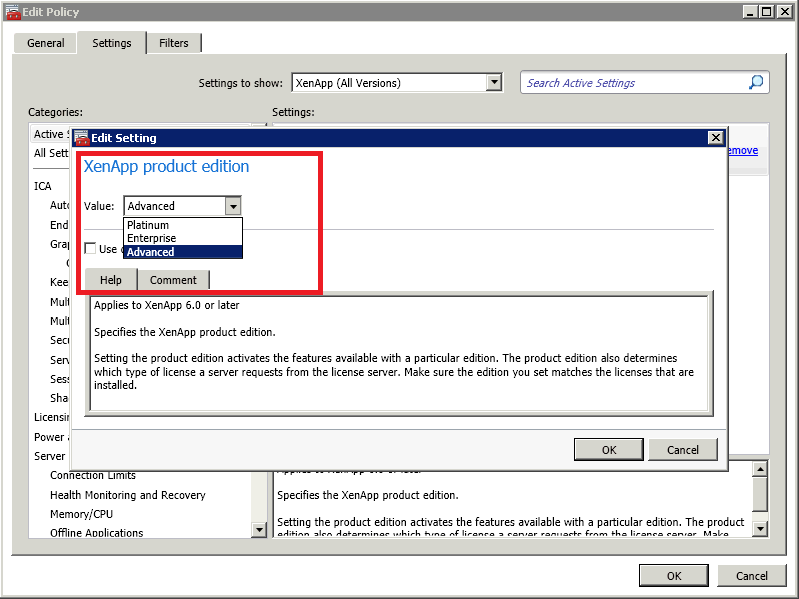 The preferred way of setting the product version in Citrix XenApp 6.5 is via the Delivery Services Console (navigate to Policies > Computer > Server Settings). In Citrix XenApp 6.5 the product edition needs to be set via a computer policy, for example in the Unfiltered policy that is always present. A policy can be configured via the Set-ItemProperty cmdlet.